The power from array of wave energy converters can be calculated theoretically from semi-analytic hydrodynamic added mass and damping coefficients of various devices (fixed or floating). However, the semi-analytic approach requires the body to be an axi- symmetric in shape. The newly released open source solver NEMOH is based on the Boundary Element Method (BEM); it solves problems of the interactions of bodies with water waves . 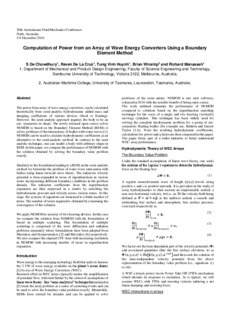 NEMOH can be used to calculate hydrodynamic coefficients as an alternative to the semi-analytic method. In contrast to the semi analytic technique, one can model a body with arbitrary shape in BEM. In this paper, we compare the performance of NEMOH with the solution obtained by solving the boundary value problem exactly. Similarly to the formulation leading to a BEM, in the semi-analytic method we formulate the problem of water-wave interaction with bodies using linear inviscid wave theory. The unknown velocity potential is then expanded in terms of eigenfunctions in various zones incorporating different boundary conditions in the problem domain. The unknown coefficients from the eigenfunction expansion are then expressed in a matrix by matching the hydrodynamic pressure and velocity across various zones. At this stage, the systems of equations are truncated to a finite number of terms. The number of terms required is obtained by examining the convergence of the solution. We apply NEMOH to an array of two heaving devices. In this case we compare the solution from NEMOH with the formulation of based on multiple scattering. This formulation of multiple scattering is comprised of the wave diffraction and radiation problems separately where formulations have been adopted from Mavrakos and Koumoutsakos  and Mavrakos  respectively. We also compare the elapsed CPU time with increasing resolution in NEMOH with increasing number of terms in eigenfunction expansion.